The legislature of each state in the United States has designated one bird species as the an official "State Bird" for that state. In most cases the symbol for the bird species that was selected is indigenous to that state and is often recognized as being associated with that state. 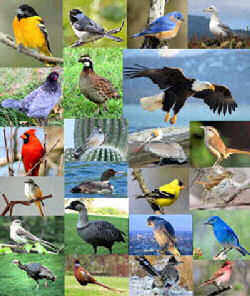 The selection of state birds began in 1927, and many a state bird was selected by a state before the species was "officially" named by the American Ornithologists' Union. Every state and Canadian province and territory has an official bird. Some states even have two official birds. The last state to choose its bird was Arizona in 1973. Alaska, California, South Dakota, and Pennsylvania permit hunting of their state birds, while Alabama, Georgia, Massachusetts, South Carolina, and Tennessee have designated an additional "state game bird" for hunting. Seven states have adopted the Cardinal as their state bird: Illinois, Indiana, Kentucky, North Carolina, Ohio, Virginia, and West Virginia. followed by the western meadowlark as the state bird of six states. The Official State Bird Designations of the 50 US States provides an interesting historical perspective as to events taking place during that period of a State's history. Birds are among the most popular state symbols in the United States. Birds (Aves) are a group of endothermic vertebrates, characterised by feathers, toothless beaked jaws, the laying of hard-shelled eggs, a high metabolic rate, a four-chambered heart, and a strong yet lightweight skeleton. Birds live worldwide and range in size from the 5 cm (2 in) bee hummingbird to the 2.75 m (9 ft) ostrich. 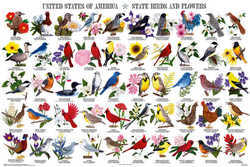 All 50 state birds of the United States and a photograph of each one is on the below list.